Next week (or the week after next week...I'm still setting it up) I'll start the countdown for the 30 GREATEST PEPLUM MOMENTS in the genre's history. I'll upload each scene at one of my Youtube channels, if there aren't any copyright infringement issues of course. I'll post one scene per day from Monday to Friday so this will last 6 weeks. I decided on 30 even though I could have easily made a 40 Greatest Moments list but the countdown would have lasted 2 months which is too long. Choosing the scenes is very difficult to do because I often have to drop or not include several scenes I personally love but didn't make the final list. These scenes will only come from Italian/European PEPLUM films. The list won't include big Hollywood productions. Which moment will be no 1? After I've done this there might be some changes to the blog. I might start posting in-frequently or post 5 days a week only instead of 7 days a week. Something like no posts on Sundays and Wednesdays. Anyway, we'll see. I'm testing 3 different counters these days and none of them say the same thing. As the screenshot below shows the pageviews, highlighted in red, are different between StaCounter (352), HiStats (409) and Blogger's own stats, at 698. I took the screenshots at the same time. It's all very confusing. The Blogger one should be the most accurate one I guess. The forum (link) is basically dead right now. No one has posted there for several weeks. 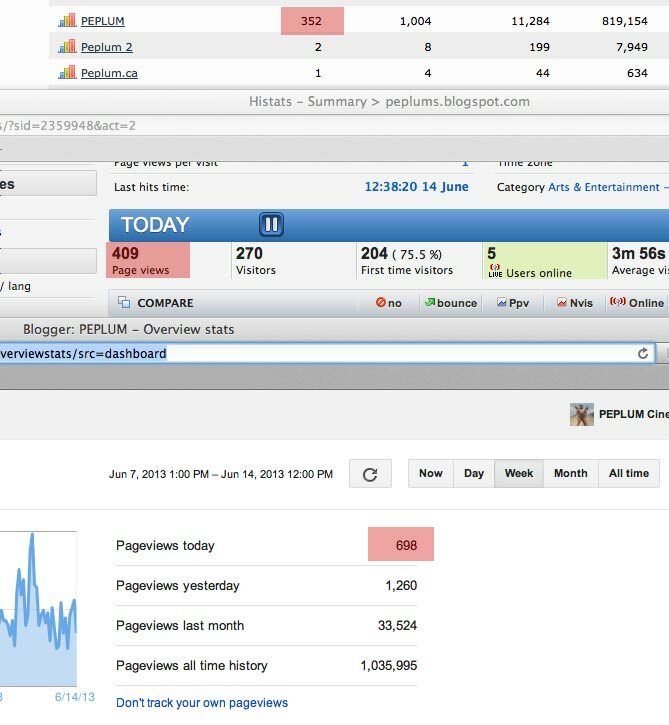 I'm not too crazy about the Forum software but merging a Forum with a blog is not easy. There aren't that many options. There are a couple of regular posters there who kept it going but right now if it doesn't pick up or new members start posting there I might have to close it again. PEPLUM X (link) is still going strong. Love doing this. It's going to exist as long as this main blog remains active. The Facebook PEPLUM page is also going strong. It's basically the same thing as the blog but those who haven't been there yet you can "like" the page. Changing the Facebook account from a personal to business one is the best thing I did regarding FB. I'll be tweeting every updates/posts made on this blog and some from PEPLUM X to Twitter from now on. 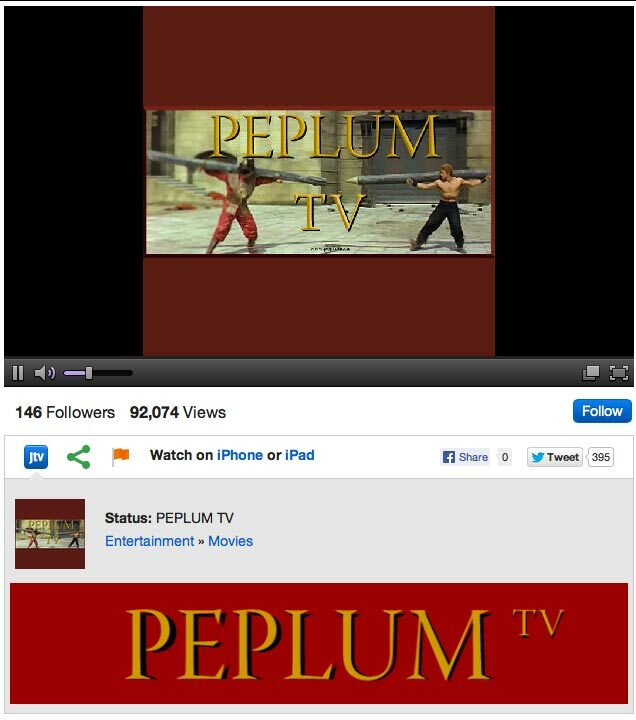 And since I use Twitter to list the films on PEPLUM TV and also new uploads at the Youtube channels you can get keep abreast of what's going on directly from there. I've started uploading full length films at the new PEPLUM TV Youtube channel. I'm testing the waters with this new channel so the uploads will be on the slow side. After they gave the old channel an undeserved strike and removed the possibility to upload anything longer than 15 minutes I decided to create a new channel which does give me the choice of uploading videos longer than 15 minutes. The problem with this is that my old channels, Old PEPLUM TV and SapphoPEPLUM, both have subscribers in the thousands and it's not easy building up everything from scratch with the new channel. I'll wait until the strike runs out in late August before uploading stuff again at the older channels but for now the place to go is the new PEPLUM TV channel. I'm still broadcasting films every Saturday at Justin.tv. I might start broadcasting on more days but for now Saturday is the place to be. I'm also currently working on a full PEPLUM website and a book as well. The book is in the preliminary stage but the subject needs a well researched book on the subject and alas the books out there, in English at least, are very lacking. All of this cost a lot of money and I'm thinking of starting a crowd-funding campaign to subsidize these projects. What do you think about this idea? I'm with you all the way. The Website and the book would be great. When I have read excerpts from one book in particular I found many inconsistencies and it sounded like the author made it all up and didn't do hardly any research. GOOD LUCK!! The Website will quite well. Well, as one of those authors out there of an apparently very lacking book on this subject, I say good luck on your book. If it's half as informative as your blog I'm sure it will be very entertaining. orsh549, I think I know which book you're talking about. There's one book in particular which is quite apparent that the author didn't see most of the films. There's probably more chance of the full website to be completed than the book (I need it to get published first) but I'm definitely focusing on a big Bible-like book. We'll see and thanks for your support. Stephen, your book is going for $497 at Amazon.ca!!! I pray no one ever pays that much for a copy, considering what it cost per unit to have them printed originally and that I still have about 400 copies sitting in the hall closet gathering dust. Not that rare or worth it.